We are grateful to Dr Edward Town of the Yale Center for British Art for identifying this portrait as the hand of the Unknown Follower of Custodis. The artist’s distinct style was first recognised and reconstructed by Sir Roy Strong in his seminal work The English Icon in 1969. Strong assembled a group of some eleven portraits including a pair of pendant portraits of Nicholas Wadham and his wife Dorothy Petre, the founders of Wadham Colege, Oxford. The paintings were attributed thanks to a recurring and identical form of inscription. They are notable for their iconic handling, somewhat two-dimensional format and limited palette. with Galerie Barnabé, Paris from 2009 to 2016. Due to the lack of inscriptions or coat-of-arms on the present portrait, the sitter’s identity remains anonymous. On the basis of costume, and based on the scale of the portrait, we can assume he was a wealthy gentleman of the growing middle-class; professional or mercantile. 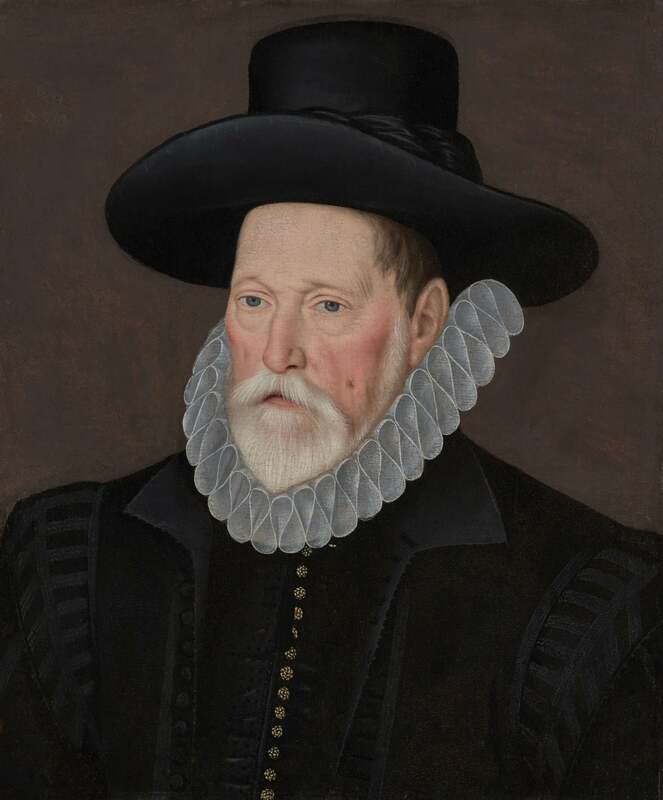 He wears a fashionably high cartwheel ruff, a fine black silk doublet with gold brocade buttons, and a tall black hat with a rather rakish black silk trim. His features are carefully defined by the artist, notably his close-clipped beard and even a mole on his left cheek. The Unknown Follower is likely to have been an assistant of Hieronimo Custodis and perhaps even inherited that artist’s pattern book. Though his work lacks the subtlety of his eponymous Master, it has its own delicacy, particularly in the modelling of the sitter’s face. It is unclear whether Custodis would have had a studio of native British assistants, or associated Flemish émigrés. Custodis himself was a protestant émigré from Antwerp, having fled to England after the capture of the city by the Duke of Parma in 1585. His dated British works are from 1589 until his death in 1593. However, more recently, Edward Town has suggested that an association with Custodis for this ‘Unknown Follower’, could be somewhat misleading. The pattern of this artist’s patrons and the location of many of his extant works suggest strongly that he was a provincial painter who worked in the Southwest of England from around 1590 to 1620.